The rumors and news for the free agency and trade talks in the NBA continued over the weekend and into this week. The Cavs are the most-talked about team now because after signing LeBron James a bunch of rumors linked the team to Kevin Love. And some rumors claim that the Cavs could give up No. 1 draft pick Andrew Wiggins for Love. 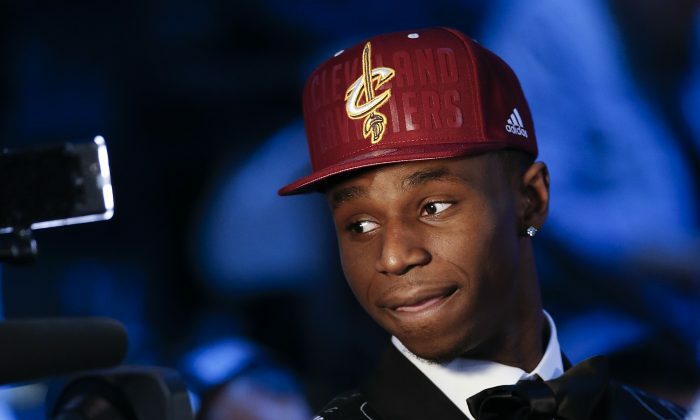 ESPN reported that the Cavaliers are close to signing Wiggins. The delay in signing Wiggins hasn’t been because of the possible trade; instead, Cleveland is exploring what to do with the $1.4 million remaining cap space, potentially using it to sign second-round picks Joe Harris and Dwight Powell. AP noted that there would be a 30-day waiting period if Wiggins signed but a deal could be agreed upon and then made official in a month. Discussions concerning a trade continued over the weekend between the Cavs and Timberwolves, reported Darren Wolfson of 5 Eyewitness News. Phil Jackson and the New York Knicks want to make at least one more trade in the coming days. Jackson already sent Tyson Chandler and Raymond Felton to the Dallas Mavericks earlier this summer. A source told ESPN that the Knicks feel they have a logjam in the backcourt with guards J.R. Smith, Iman Shumpert, Shane Larkin, and Tim Hardaway Jr. The latter is virtually untouchable, the source said, but trade options for one or more of the others are being explored. Larkin was acquired in the Chandler trade. Metta World Peace to Knicks? The New York Knicks may pick Peace back up on a mostly non-guaranteed deal. Peace wants to reunite with new team president Phil Jackson and former teammate and new coach Derek Fisher. Peace was bought out by the Knicks, which are paying him $250,000 for next season. If he made the team, he’d be eligible for the $1.4 million veteran’s minimum. Sources told the Post that Peace wouldn’t have asked for his release if he had known Jackson was coming. If the reunion doesn’t work out, Peace may become the assistant coach for the Palisades High School girls basketball team in Los Angeles. Greg Monroe is the top big man that hasn’t been signed yet, although he’s a restricted free agent. Monroe hasn’t signed any offer sheets yet, leading to a spate of rumors. The latest one is that the Phoenix Suns may be considering giving him an offer, according to Jordan Schultz of the Huffington Post. The Suns want to snag Monroe but also re-sign Eric Bledsoe, their own restricted free agent. MILWAUKEE—The Milwaukee Bucks have been awarded the contract of Kendall Marshall, the second-year guard who was waived last week by the Los Angeles Lakers. Marshall appeared in 54 games for the Lakers last season, averaging 8.0 points, 8.8 assists and 2.9 rebounds per game. He shot 39.9 percent from 3-point range. He’ll be reunited in Milwaukee with Bucks forward John Henson, his teammate at the University of North Carolina. Phoenix drafted Marshall with the 13th pick in the 2012 draft. He was traded to Washington with Marcin Gortat and two other players for Emeka Okafor and a draft pick. The Wizards waived him, and he played seven games in the NBA D-League before the Lakers called him up. DALLAS—The Dallas Mavericks have signed free agent forward Richard Jefferson as a possible replacement for Vince Carter off the bench. Terms of the contract announced Monday weren’t released, but it is reportedly a one-year deal for the veteran minimum of $1.4 million. Jefferson started 78 games for Utah last year but figures to be used as a 3-point threat coming off the bench. That was the role last season for Carter, who signed with Memphis as a free agent. The 34-year-old Jefferson has averaged 14.5 points and 4.5 rebounds in a 13-year career that started in New Jersey, where he went to the NBA Finals twice with Jason Kidd and Carter. He played in the 2001 NCAA title game with Arizona.